Jordan on Tuesday summoned the Iraqi charge d’affaires after employees at Baghdad’s embassy beat and kicked Jordanian supporters of Saddam Hussein at a seminar on mass graves in Amman. “The foreign ministry today summoned the Iraqi charge d'affaires to condemn this assault that contradicts all diplomatic norms,” AFP reported the Jordanian Foreign Minister Nasser Judeh as saying to the lower house of parliament in a televised meeting. The MPs called on the government to “take all necessary means to punish the attackers, expel the Iraqi ambassador and demand an Iraqi government apology,” Petra reported. Meanwhile, dozens of Jordanians demonstrated outside the Iraqi embassy on Tuesday and Monday demanding Amman expel the ambassador. 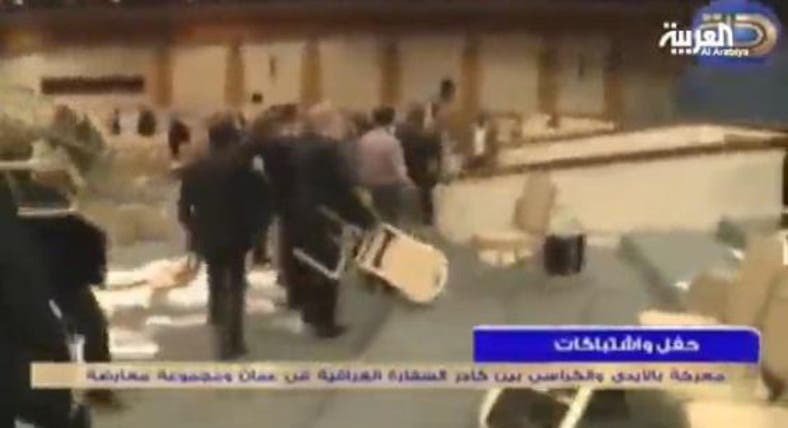 A YouTube video published on Sunday, showed mostly Jordanian supporters of Saddam and Iraqi opponents physically kicked each other and threw chairs at one another during an event organized by the Iraqi embassy in Amman to commemorate mass graves of victims slain by Saddam’s regime. The protesters said their dignity as Jordanian must be restored especially the assault against their country’s citizen happened on their ground. They said Jordan must try both Jawad and his staff and that the Jordanian government shouldn’t be lenient with them. However, the Iraqi embassy issued a statement on Monday saying that the violent act was by some attendees who joined the event an hour later. “After one hour of the start of the event, people were surprised after some new attendees, who sat at the last row, started cursing the Iraqi government and called them traitors. They also chanted pro-Baath slogans,” it said. The statement added that the embassy’s staff tried to calm them but the new comers insisted on being violent. In March 2003, the U.S. invasion of Iraq brought an end to Saddam’s hold on power and his one-arty Baathist rule in the country.